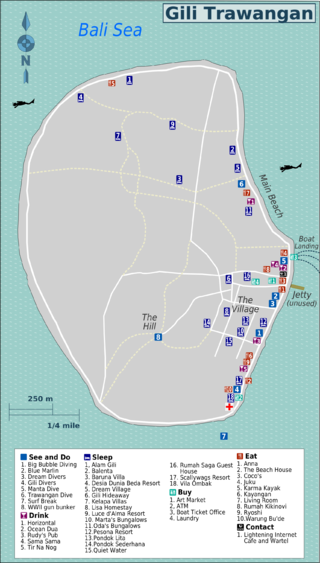 Gili Trawangan (Terawangan), or simply Gili T, is the largest and most visited of the three Gili Islands off Lombok. This is the largest of the three Gili Islands with an estimated permanent population of about 800. Trawangan was the first of the three islands to attract visitors in any numbers, and it was backpackers who led the way. In the 1990s the island developed a reputation as a wild party destination with cheap accommodation, no police. Whilst that is still partially the case, Trawangan has matured into a destination that has a far wider appeal. The thriving dive industry of the Gili Islands is centred here (although some operators have outposts on the other two islands), and since about 2005, the island has gone through a massive development boom, and a number of upscale sleeping, eating and drinking establishments have opened. Any visitor to Trawangan should be prepared for a real mish-mash of fellow travellers; some will be ensconced in US$400 per night, unashamedly Bali-style villas, while others would be quite happy to rest their crusty dreadlocks on an organic hemp pillow after a tough day on the mushies. Most of the accommodation and other facilities on the island are on the eastern side, sheltered from the winds and rough seas of the Lombok Strait which sometimes batter the opposite side of the island. Boats dock here as well, on the beach just north of the market. This generally means a walk in the shallow water to disembark. There is also a private concrete and wood jetty used by a few companies. A footpath circumnavigates the whole island and various tracks criss-cross, nearly always leading back to this coastal path. The area set back behind the east coast beachfront establishments is where most of the locals live (and where there is a lot of budget accommodation), and is known simply as "the village". There is a low lying hill in the southern centre of the island, which is easily reached from the tracks heading southwest from the back of the village. The daily Perama  service will take you directly from Senggigi departing 8AM to Gili Trawangan in under two hours for a flat Rp 150,000, plus optional Rp 10,000 for pickup at your lodging in Senggigi. Other operators can swing similar deals for Rp 75,000 (as low as Rp 50,000 in some homestays), but these often involve going through Bangsal - to avoid this, make sure the private boat will be used (generally departing from Teluk Nare), not the public boat from Bangsal - in the latter case doing it yourself by catching a taxi to Bangsal will be cheaper even for 2 people. Another option is to arrange a speedboat charter or pickup with your hotel, or a dive shop on Trawangan. These speedboat services run in and out of the lovely Teluk Nare bay in Lombok, south of Bangsal and thus avoiding the thoroughly unpleasant experience of combating the touts there. A speedboat charter normally takes up to three passengers, crosses in 20-30 min, and will cost about Rp 500,000. The easier way is using travel agent in Lombok like First Lombok Tour  and others, they will handle transportation to Gili Trawangan. The drive north from Senggigi follows the coast and the road offers panoramic views and glimpses of roadside village life. It is not a lengthy trip and the road has recently been upgraded throughout almost the entire length to either Teluk Nare and Bangsal a little further to the north. It is a quite scenic trip and glimpses of the Gilis can be seen as the road rises over the headlands whilst travelling up the coastline. The cheapest way to reach Gili Trawangan is on a Public boat which departs from Bangsal from 8AM-5PM (but rarely later than 4PM). The official price is Rp 15,000 since 1st August 2015. You would be asked to pay additional IDR5000 as a foreigner (wisatawan asing) and IDR2500 as terminal fees. Sometimes these depart only when there are enough people, normally a minimum of 15 is enough. If numbers are insufficient you might be in for a long wait. The official maximum is 30 people but sometimes the boat is overloaded by the time it is ready to depart. In one case, 72 passengers were noted on a trip. The experience of departing from Bangsal is rarely pleasant due to the very persistent touts who infest the place, just try to ignore them and do not listen to their generally fanciful tales that involve you paying them money to solve an imaginary transportation problem. They often provide a chorus of gloomy predictions regarding the alleged unavailability of services, then if successful they just place unknowing passengers upon the normal scheduled service or a private charter at an often seriously inflated prices. Buy your tickets direct from the official Koperasi Angkutan Laut Karya Bahari office. In Bangsal this is located inside the main building just on the waterfront left near the door at the eastern corner. The Koperasi operate the Public Boat, the Shuttle boat, the Island Hopping boat and also offer (official) Charter boats. The Public boat office on Trawangan is right on the beach north of the unused concrete jetty, near where you are dropped off. You may need to wait until 15-20 others show up, so it's best to be there early in the morning (7AM-8AM) if you want to get moving quickly. The last boat leaves Trawangan around 3PM. This is the standard method to reach Gili Trawangan and is used by both local residents and tourists. The maximum number of passengers is fixed at 30 persons but it is often overloaded with goods and or passengers. If it seems clearly unsafe due to either overloading or prevailing weather conditions then it is most likely best not to board it. This service supplements the Public boat (ferry) service and departs Gili Trawangan to Bangsal (on the main island of Lombok). Bangsal to Gili Trawangan departs at 5PM, the official price is Rp 28,000. Gili Trawangan to Bangsal departs at 8:15AM, the official price is Rp 28,000. (This is more expensive than the standard Public boat cost officially fixed at Rp 12,500). Informal and unofficial charters are also available from private operators to travel from Bangsal to Gili Trawangan. If requiring one try to deal only with the boat operator, ignore the touts and 'facilitators' and use your time over a negotiation, any hint of haste or urgency is sure to raise the price. Ferry operators may sometimes enter into informal arrangements with passengers to journey inter-island. In this situation a passenger boards a boat that is meant to go directly to Bangsal from one of the three Gili islands but instead it detours and sets down on the beach at another island whilst en-route. The prices are a movable feast but people will normally pay a price of around Rp 35,000 (Sep2015). Inter-island access on the public boats in this manner is dependant upon timing, weather, loading, payment and the inclination of the crew to facilitate an inter-island journey and such arrangements are not officially sanctioned. The standard procedure is to travel to Bangsal and make a separate trip to the different island or to use the very limited official service. The price for a single journey Public Boat ferry journey from Gili Air to Bangsal is Rp 12,000. The price for a Public boat from Gili Meno is Rp 14,000. The price for the subsequent Public boat to Gili Trawangan from Bangsal is Rp 15,000, this assuming the required connection was made at Bangsal. Informal private charters are also available. Prices are subject to negotiation, take your time over the process. But if you don't have much times, you can contact Breeze Lombok to arrange your trip with their private boat. For more detailed information on fast boat companies, routes and travel advice see Gili islands main page. All fast boat services are subject to weather conditions and the trip across the Lombok Strait can get quite bumpy especially in July and August. Most operators offer pickups and drop offs but all cover slightly different regions. Prices usually include land transport from/to your destination in Bali. Double-check with operators for seasonal discounts, schedules and current operational status. Local prices quoted in a travel agency on the beach, including further transfer to Ubud/Sanur/Kuta (February 2013, low season): Rp 400,000 for a foreigner, Rp 300,000 for Indonesian (finally, the latter price was offered for a foreigner traveling together, so it looks like foreigners may also try and bargain). The quality (and safety) of the boats used may vary wildly, so make sure you know what you're purchasing before booking. If you have legitimate concerns about either the vessel, the operator or the prevailing weather conditions do not board the boat, immediately seek a refund of your fare and make alternative arrangements for your trip. Consider your options and choice of provider very carefully. During rough weather flights across the Lombok Strait may provide a more comfortable and safer journey. Bicycles are available for rent and the main tracks are good enough for riding. Expect to pay about Rp 60,000 per day, and for two hours about Rp 25,000. A ride around the island is less than an hour, but you need to walk your bike at a few points due to the sandy nature of the track. A bike is also great for exploring the inland areas, where you can see a lot of cows, goats and chicken as well as local homes. Unsurprisingly though on a tiny island, walking is the preferred and most appropriate way of getting around. If you have heavy bags and are staying well away from the departure area, you will need a cidomo (horse cart) to get to and from the boat. A short trip should cost about Rp 50,000. Gili Trawangan is the centre of a thriving dive industry for the Gili Islands. All of the operators have their main dive shops located here. There are about a dozen active dive sites, and all of the shops run a regularly rotating program of daily fun dives to one of more of these. Fun dives, muckdiving, technical diving and wreck dives are a staple and Gili Trawangan is well known as a world class teaching centre. The operators are very professional, the warm waters offering a wide range of easy to challenging dive sites (including some with fairly strong currents), and the visibility usually good. Gili T makes for an ideal teaching environment, whether you are a first timer, or a diver looking to extend your qualifications. Freedive Gili is located close to the harbour on Gili Trawangan, and offers freedive and apnea (breath holding) courses for beginners to advanced. It is the only freedive centre in the region and is owned and operated by British freedive record holder Mike Board. Gili Yoga center shares an office with Freedive Gili and boasts its very own Yoga pavillion. Daily Yoga classes are given in the warm open air, surrounded by a tropical garden and the sounds of nature. Gili yoga offer services including: Daily meditation and pranayama, twice daily yoga practice, luxury accommodation, group activities (snorkeling, sunset boat ride) and gourmet vegetarian food. The Yoga Place Gili offers Yoga and Meditation all day for all levels in a peaceful surrounding. Daily Stand Up Paddle Yoga at 8.30 am and Sunset Beach Yoga at 4.30 pm. After a yoga class you can enjoy a big fresh juice or a health vegetarian dinner on the terrace with sea view. See Through/ Clear Bottom Kayaks & Canoes new to Gili Trawangan, You can hire/rent a kayak/canoe and explore the seas. They are made of strong clear plastic. Available on the beach outside Horizontal bar. The easiest spot to find some productive snorkelling is off the main beach, north of the boat landing. Enter the water approximately in front of the Almarik hotel. If you start north of the beach (about where you can see seaweeds growing at low tide roughly level with Gili Meno's northern extent), and go with the current back towards to the most crowded sunbathing area, you will likely need to kick only when you want to stop to look at something. The healthy corals are around the area where the wall drops off and the deeper water begins. Nearer the shore you will find only dead coral. Turtles can be seen often, and also the occasional trigger fish amongst the more common reef inhabitants. At low tide it is difficult to get in without reef shoes. Always watch out for potential waves that can push you into the coral that are just below water level. A better coral reef is off the northwest coast, but you have to be very keen to go through the hardship of getting out there. The only access to the reef involves walking over a substantial area of dead, sharp coral, and back again when you have finished. If you are a keen snorkeller the effort is worth it, and you are very likely to have the waters to yourself. Small, purple jellyfish are sometimes plentiful around the island, and they seem to love stinging snorkellers. The reaction is one of considerable irritation, but the stings cause no serious harm. Alternatively, you can take a snorkeling boat tour. Most trips take 4-5 hours with a lunch stop in Gili Air. The costs start at IDR100,000 and come with water, mask, snorkel and fins. Package trip including lunch is IDR120,000. Vest will cost additional IDR20,000. Gili Trawangan has a fast right hander which can really pump with the right conditions. The best waves are at high tide, and the underlying reef can be sharp so booties can come in handy. The surf break is off the south coast - just follow the locals who will be out and jogging with their boards whenever the surf is decent. You will find no shortage of locals eady, willing and able to rent you board. There are a few breaks off Gili Air and Gili Meno, but they are more difficult to reach and smaller. The best season is the January-June wet season, with swells from 1-2 m. Daily conditions can be checked out at Magic Seaweed . There are some lovely walks to be had on the island, although the perimeter coastal track is perhaps not as scenic as those on Gili Meno and Gili Air. A leisurely stroll all the way around will take 90-120 minutes, depending on just how leisurely you are. The hill in the south can be easily reached by taking one of the tracks that lead west or southwest from the back of the village. Dawn and dusk are the best times to climb up here. The sunset views back towards Bali are quite lovely, and in the mornings the sun rises over majestic Mount Rinjani on Lombok. On the top of the hill lie the remains of a World War II Japanese gun bunker. Head to the west side of the island you are staying on, find a spot in the sand or a chair in a beach bar and watch the sun paint the sky orange as the sun sets behinds Bali’s Mount Agung. On Gili Trawangan there are two popular sunset bars about half and hours walk or 10 minutes in bike from the pier (head south along the coast road), where people gather for a drink before the sunsets. Recommended place where to based yourself to spend your time to see the sun going down. If you like it more quiet and lonely, you just need to drive or walk along the beach a little further and you surely you will find one or another deserted stretch of beach. There are over a dozen ATMs on the island, with most located on the Eastern side on the island close to the jetty. Most ATMs are run by Indonesian banks, but there are also two Australian Commonwealth Bank ATMs. The majority of ATMs provide Rp 50,000 notes and have a maximul withdrawal up to Rp 1,500,000; those dispensing Rp 100,000 notes (you will see a sticker on the machine) often have limit of Rp 2,000,000 or even Rp 3,000,000 (CIMB Niaga on the main beachwalk, note - only one of the terminals there dispenses 100,000's). Commonwealth Bank ATMs are also known for their large limits (3-4 million), however they now charge an additional Rp 20,000 fee from most foreign cards (you'll see a notification with an option to cancel the transaction), notably excluding Visa Europe. The exchange rates offered on the island are generally poorer than on Bali or Lombok, but not that much (in the tourists areas of Bali you may easily get even lower rate if not choosing the exchange point wisely). Do not believe the touts at Bangsal that there are no ATMs or money changers. They will try to convince you to change money with them and charge you up to 10% commission for it. The Art Market (Pasar Seni) next to the pier has a few scruffy stalls hawking souvenirs, but it's all brought in from elsewhere, and the selection is far more limited than what you'd find on Bali or even Lombok. Budget places are thinner on the ground that they used to be, but still not hard to find. If you really want to watch the pennies, do as the locals do and eat in the local warungs inside the village, or at the night food market near the beachwalk south of the jetty. These serve the usual range of Indonesian staples: fried rice, fried noodles and bakso (meatball soup); on the night market, you will also find seafood (marked up for tourists' wallets, though), pancakes, snacks, desserts, and even beer. The push carts and few "warungs" on the main beachwalk are overpriced as much as twice compared to Bali or Indonesian cities (for example, selling sate ayam on the street for Rp 20,000 or nasi padang for Rp 22,000). Barbecued fish is excellent here and every evening many of the better restaurants fire up the charcoal. The deal is that you chose your fish - red and white snapper and trevally are especially good - and it is grilled on the spot. Many restaurants serving grilled seafood along with sides for between 60.000-100.000. It's best to walk the road and choose from the fresh fish on display outside the restaurants. There are regular party nights on Gili Trawangan - the various bars take it in turn to host the late night gig (up to 4AM), to ensure that everyone gets together in one place rather than being spread around. The island is small and it is easy to find everything; just ask around for where the party is going to be on any given night. Be very careful with locally produced spirits, especially arak. It can contain methanol and has caused many cases of serious injury and even death (as recent as new year 2012/13) among tourists and locals alike. If you suspect that what you've been served is not what you ordered, take it back. Sticking to western owned and managed bars will reduce the risk. Power is normally available 24 hours a day and many of the hotels now have A/C. However there may be frequent disruptions to the supply. This problem arises from regional power generation insufficiencies. To address this issue many mid-range and upmarket hotels and restaurants on the Gili islands have their own back up generators. Be aware that the closer you sleep to the mosque, the more likely you will be disturbed by loud night time prayer calls. You will find most budget options behind the east coast frontage in the village, or by walking north from the boat landing. Travellers who remember Gili Trawangan from the 1980s and 1990s may be surprised to learn that there are now more than 100 official places to stay on the island, and still more are being built. Balinese-style luxury villas have started to pop up on Gili Trawangan. They have not yet quite got standards of service right, so although you will be paying up serious dollars to stay at some of these places, be aware that the service might disappoint a little. High end private accommodation is still a relatively new thing on Trawangan, so it is only to be expected that it will take some time to get things right. See Main Gili Islands article for more information. There is a small clinic adjacent to Vila Ombak. They are quite used to treating travellers with minor ailments, including some stomach problems, but any visitor with a serious medical issue should make thier way to to Mataram hospital on Lombok. There are several internet cafes on Trawangan for feeding your Internet addiction, although connection speeds can often be slow. Printing is possible in a few internet cafés and you can even hook up your laptop in some. Lightening Fast, just north of the jetty, costs Rp 500 per minute but the supposedly fast service rarely is. Of the restaurants providing wifi, Scallywags is the best bet with a fast, dedicated ADSL service from mainland Lombok. William's Bookshop, right behind the Art Market on Gili Trawangan, acts as a de facto post office, sells stamps and can mail out your postcards. See Gili Islands main article for further information. There is a cheap and cheerful public laundry service at the back of the Art Market. Laundry is normally returned the next day, and when compared to the prices charged by hotels, this can save you a fair bit of money if you are on the island for anything more than a day or two. Lombok — if you are on one of the Gili islands you are already in Lombok, go to the main island to see the rest of it including nearby Tanjung and Senggigi a little further down the coast. Gili Kondo — also a quieter Gili with beautiful coral undersea. It is situated by in east Lombok. Other gilis closed to gili Kondo are gili Patagan, gili Kapal, gili Bidara and Kenanga island. This page was last edited on 18 March 2019, at 23:52.